Oncore fuel monitoring is able to detect any sudden fuel changes. Users can receive alerts via SMS, email or the software itself in the event that there is a drastic change in fuel in their fleet to avoid and minimize any losses or increase in operation costs. 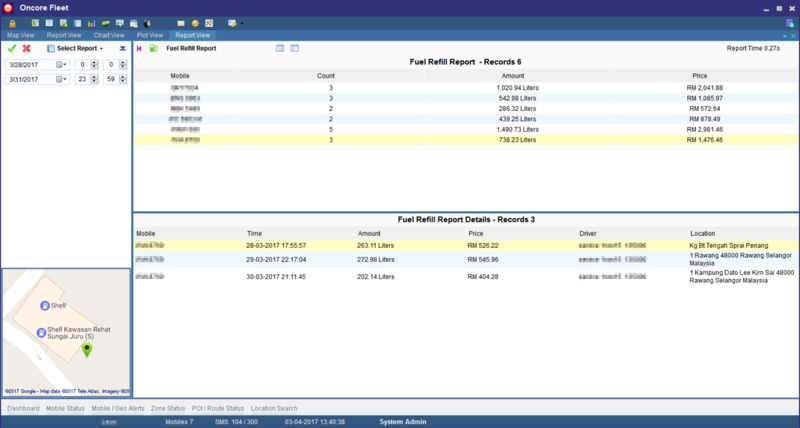 You can choose many features such as Fuel Refill History, Fuel Loss History, Fuel Used History and Download Report and Graphs through the Oncore Fleet Software. Fuel Can Be Said As One Of The Biggest And Highest Expenses Transportation Companies Face Today. Inefficient fuel management may lead to higher costs or a marked decrease in profits. Businesses need assistance in helping them to manage the fuel consumption of their fleet efficiently, proactively and expertly to decrease costs. There may be uncontrolled factors like weather which may affect fuel consumption but with the right technology and support, users can manage actions such as excessive over-revving, improper routing and navigation or even speeding. What Is Oncore Fuel Monitoring? Oncore Fuel Monitoring enables users to receive remotely fuel information on their vehicles with the support of a round-the-clock Control Centre. 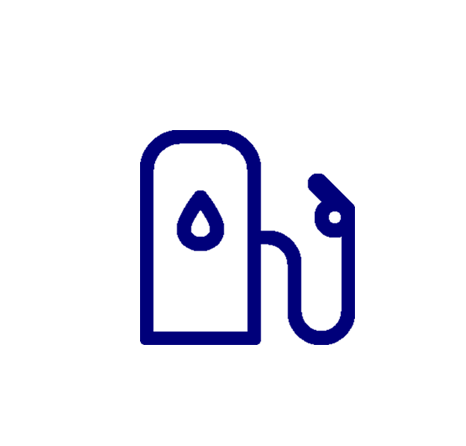 What Can Oncore Fuel Monitoring Do? Oncore Fuel Monitoring provides users with fuel status updates combined with your vehicles location data, all in real-time. The satellite-based location tracking offers tools in improving operational efficiencies, monitor your drivers’ performance or simply to improve your operational efficiency. Oncore Fuel Monitoring monitors in real-time the level of fuel tanks, fuel consumed by each vehicle and fuel purchases. What Can I Get From Oncore Fuel Monitoring? The knowledge about your vehicles fuel status and updates for better monitoring and management of fleet. Reduce the time and costs spent on rerouting of vehicles due to fuel refilling as it arms and prepares you for fuel refilling and planning of your fleet schedules,reduce or eliminate out of route journeys that waste time and money. Reduces and better manage your fuel consumption through better monitoring of drivers and vehicles equipment. Avoid the occurrence of sudden fuel drop that can cause indirect losses or hamper your business operations. Secured environment for your fleet and drivers. 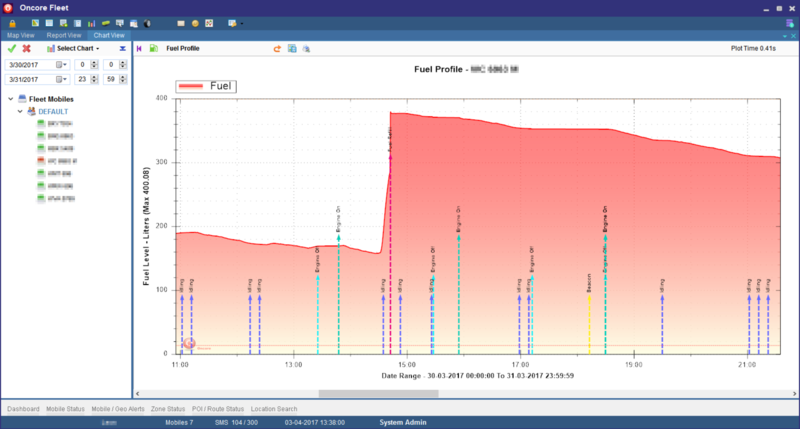 What Is Inside The Oncore Fuel Monitoring Software? 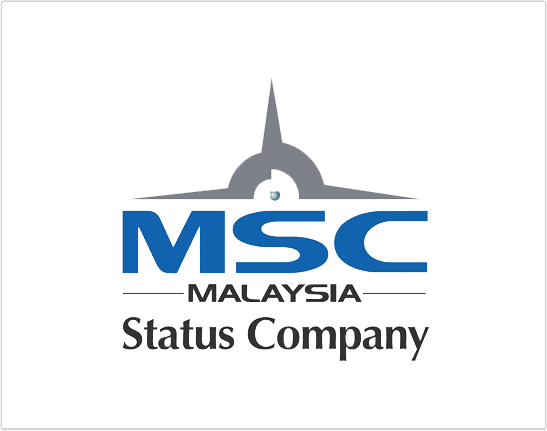 Users are provided with a unique username and password to log in the application. All information and fuel monitoring are available by utilizing the Oncore Fleet software. The software provides real-time fuel capacity information, real-time alert notifications via software and/or SMS. Users can also download reports and graphs. What Is Inside The Oncore Fuel Monitoring Hardware? An Oncore Fuel Sensor is installed in the fuel tank which monitors voltage in fuel tank. Together, the Oncore GPS Module is also equipped within the vehicle’s cabin. Installation is safe and secured.